The Albatross was a large machine with a wing span of 40 feet and a wing chord of 7 feet. An 8 foot board ran along the bottom of the wooden fuselage. The pilot was supposed to be able to shift the center of gravity by running toward the front or back of the craft. This photo shows the 'aeroplane' above the fuselage. The angle of incidence of this large kite surface could also be adjusted by the pilot. To launch the ungainly craft, a wooden tressle was constructed. 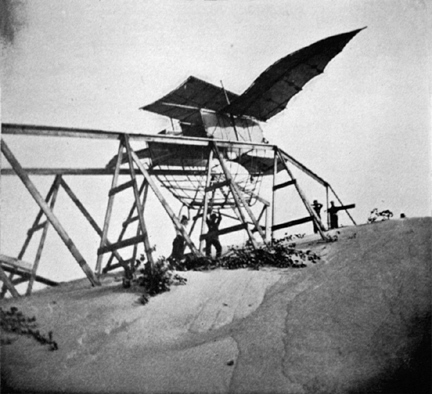 The Albatross was first flown on September 4, 1896 with 65 lbs of sand for ballast. It flew a short distance, then was damaged in the landing. On September 15 as the Albatross was being set up for testing, a sudden gust lifted the plane and Bustov (who was inside checking the balance) 2 1/2 feet into the air, and breaking a brace. The craft was repaired the next day, and tested on September 17, once again with sand as ballast. It flew about 100 feet. 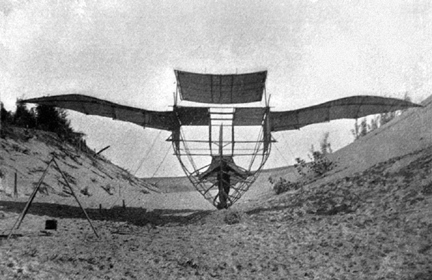 The Albatross was last tested on September 25, once again with sand instead of a live pilot. It flew a short distance, then crashed into some trees and breaking a wing. At that point, it was clear the craft fell somewhat short of the abilities of its namesake, and the Albatross was abandoned.